Observations in 2017 showed that the “hole” in Earth’s ozone layer—which forms over Antarctica at the end of each southern winter—was the smallest recorded since 1988. According to NASA satellite estimates, the ozone hole reached its annual peak extent on September 11, spreading across 19.6 million square kilometers (7.6 million square miles), an area about 2.5 times the size of the United States. Ground- and balloon-based measurements from the National Oceanic and Atmospheric Administration (NOAA) agreed with the satellite measurements. The average area of ozone hole maximums since 1991 has been roughly 26 million square kilometers (10 million square miles). The map above shows the Antarctic ozone hole at its widest extent for the year, as measured on September 11, 2017. 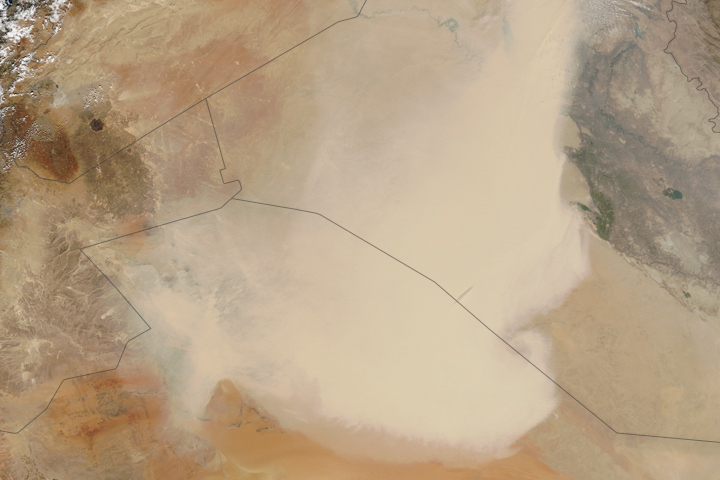 The observations were made by the Ozone Monitoring Instrument (OMI) on NASA’s Aura satellite. The smaller ozone hole in 2017 was strongly influenced by an unstable and warmer-than-usual Antarctic vortex, a low-pressure system that rotates clockwise in the atmosphere over far southern latitudes (similar to polar vortices in the northern hemisphere). The vortex helped minimize the formation of polar stratospheric clouds (PSCs); the formation and persistence of PSCs are important precursors to the chlorine- and bromine reactions that destroy ozone. Although warmer stratospheric weather conditions have reduced ozone depletion during the past two years, ozone holes are still large because atmospheric concentrations of ozone-depleting substances (primarily chlorine and bromine) remain high enough to produce significant yearly ozone loss. The smaller ozone hole extent in 2017 is due to natural variability and not necessarily a signal of rapid healing. 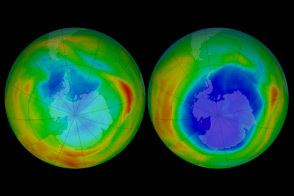 First detected in 1985, the Antarctic ozone hole forms during late winter in the Southern Hemisphere as returning sunlight catalyzes reactions involving man-made, chemically active forms of chlorine and bromine. These reactions destroy ozone molecules in the stratosphere. At high altitudes, the ozone layer acts like a natural sunscreen, shielding the Earth’s surface from harmful ultraviolet radiation that can cause skin cancer and cataracts, suppress immune systems, and damage plants. Thirty years ago, the international community signed the Montreal Protocol on Substances that Deplete the Ozone Layer and began regulating ozone-depleting compounds. 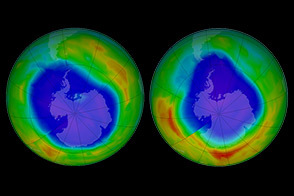 The ozone hole over Antarctica is expected to gradually become less severe as chlorofluorocarbons (CFCs) continue to decline. 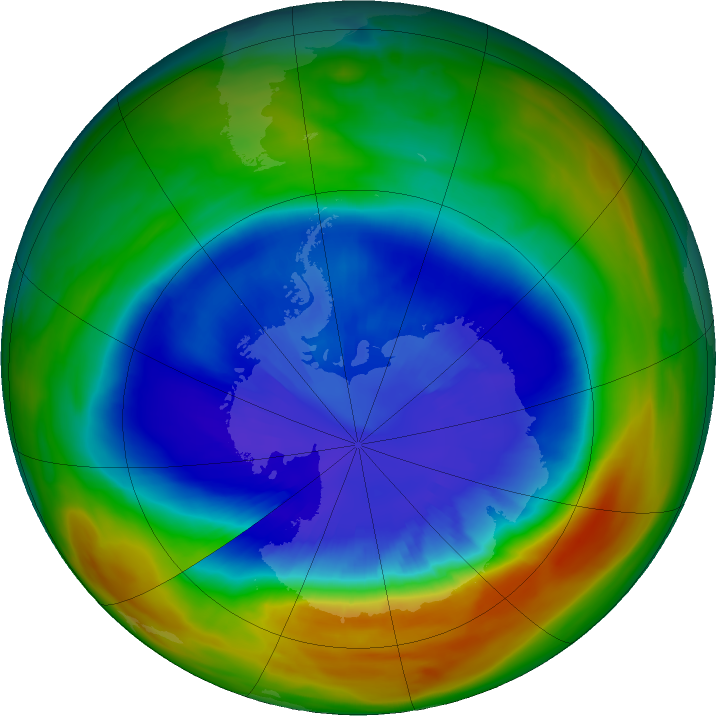 Scientists expect the Antarctic ozone hole to recover back to 1980 levels by 2070. 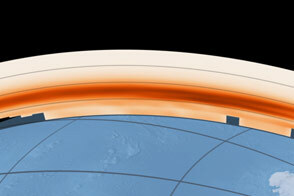 As both images show, the word hole is not literal; scientists use it as a metaphor for the area in which ozone concentrations drop below the historical threshold of 220 Dobson Units. During the 1960s, long before the Antarctic ozone hole occurred, average ozone concentrations above the South Pole ranged from 260 to 320 Dobson Units. 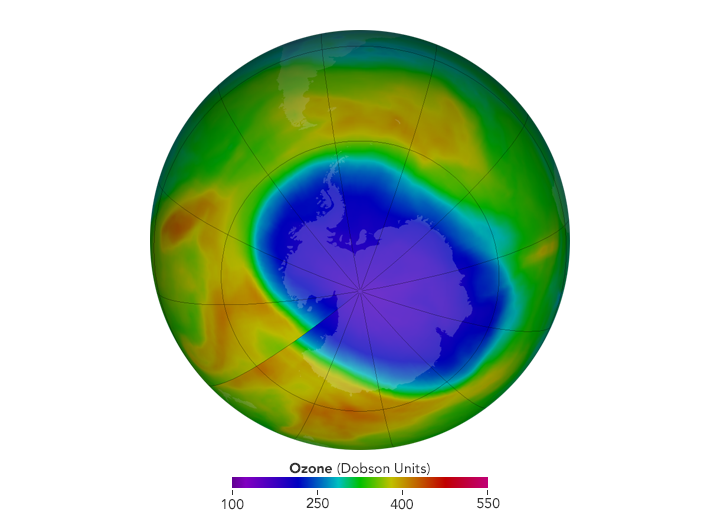 Globally, the ozone layer today ranges from 300 to 500 Dobson units. 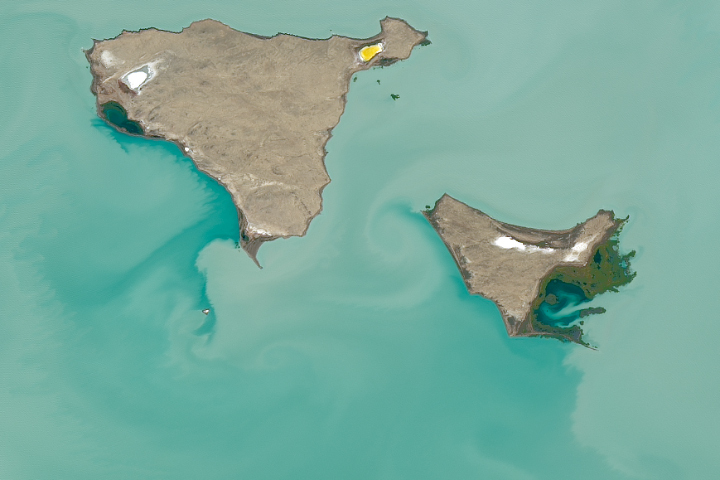 Editor’s Note: The uneven seam in the contours of the data (lower left quadrant) marks the location of the international date line. 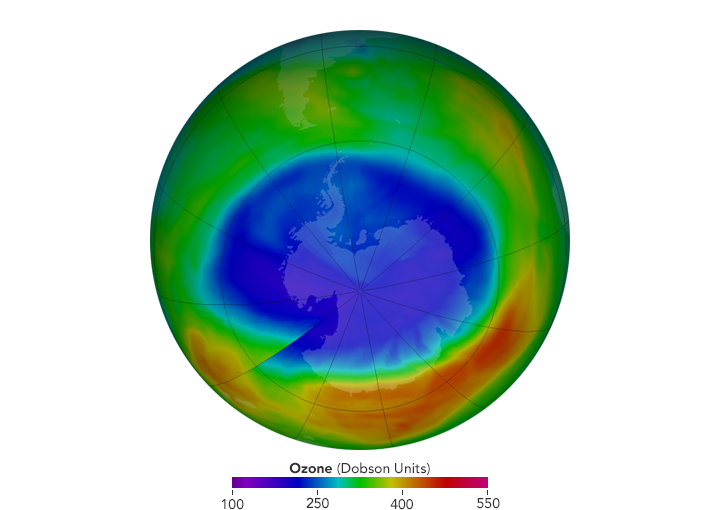 Ozone data are measured by polar-orbiting satellites that collect observations in a series of swaths over the course of the day; the passes are generally separated by about 90 minutes. Stratospheric circulation slowly shifts the contours of the ozone hole over the course of the day (like winds shift the location of clouds). The contours move little from any one swath to the next, but by the end of the day, the cumulative movement is apparent at the date line. NASA Earth Observatory images by Jesse Allen, using visuals provided by the NASA Ozone Watch team. Story by Katy Mersmann, NASA GSFC, and Theo Stein, NOAA Office of Oceanic and Atmospheric Research, with Mike Carlowicz, Earth Observatory. 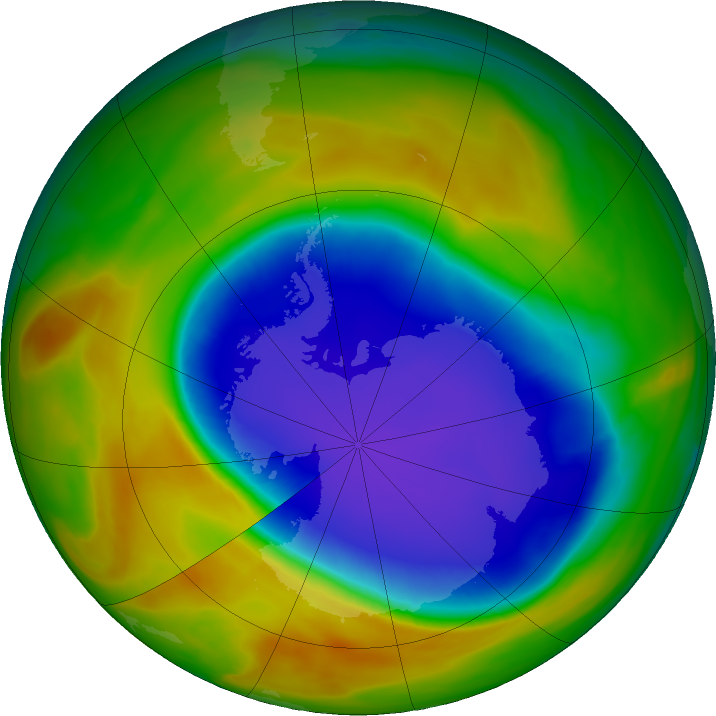 The smaller ozone hole was strongly influenced by an unstable and warmer-than-usual Antarctic vortex. NASA (2017) NASA Ozone Watch. Accessed November 2, 2017. NASA Earth Observatory (2017) World of Change: Antarctic Ozone Hole.